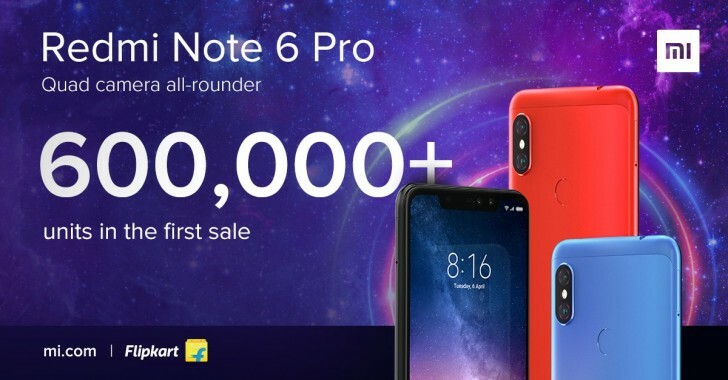 Xiaomi launched the Redmi Note 6 Pro in India a couple of days ago, and the device has so far been a resounding success in the subcontinent. In its first sale in the country, the company managed to move more than 600,000 units. That’s pretty impressive, and Xiaomi expects to sell even more in upcoming sales. The Redmi Note 6 Pro is the new king of the Redmi series, which focuses on pairing good specs with very affordable prices. It starts at just INR 13,999 ($198 or €175), while packing a 6.25-inch 1080×2280 notched touchscreen, the Snapdragon 636 chipset, 4GB of RAM, 64GB of expandable storage, a 12 MP main rear camera with f/1.9 aperture and 1.4µm pixels, a 20 MP main selfie shooter with f/2.0 aperture, and a couple of depth sensors for bokeh – one on the back, one on the front. It has a 4,000 mAh battery and runs Android 8.1 Oreo with MIUI 9 on top.